Dune sites are quite resilient to storm attack and generally recover quickly. The presence of nearshore bars add to the stability of a site but also result in highly mobile systems which are difficult to categorize. Nearshore attached bars are the deciding factor for stability. They provide the protection needed for the backshore and make sand available for aeolian transport necessary for dune creation. 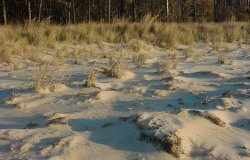 Preliminary studies showed that a dune system may serve a role in ground water quality remediation when the water is discharged into shallow ground water systems from upland landscapes that have demonstrated elevated nitrogen loadings.